The TaylorMade M4 fairway wood has been designed to pack a punch and provide an impressive combination of distance, forgiveness and versatility. At address the M4 fairway wood features the same carbon crown design as the previous M2 fairway, however the new crown features a 5-layer design that saves an additional 8 grams of weight that is relocated in the head to areas that you need it. TaylorMade have used a large footprint and a low-profile shape that will make launching the M4 fairway high into the sky extremely easy, the low-profile design makes it incredibly easy to hit from a variety of lies. The inclusion of the popular Speed Pocket on the sole helps enlarge the sweetspot and provide extra forgiveness as well as extreme ball speeds across the face for incredible distance off the middle and anywhere on the face. The Speed Pocket will also provide a better flight to ball that are struck low on the face for increased accuracy on mishits. 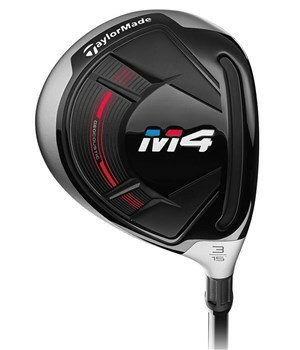 To eek out as many yards as possible from the tee TaylorMade have fitted the M4 fairway wood with the premium Fujikura Atmos Red shaft as standard. This shaft has a mid spin, mid-high launch profile that will help most amateur golfers. Love the 3 wood and really love the price and quick delivery from Halpenny. I will recommend to all my friends.